The marginal economic strength that was described in the most recent GDP release from Washington has caused many to double down on their belief that the Federal Reserve will begin tapering Quantitative Easing sometime later this year. While I believe that is a fantasy given our economy’s extreme dependence on QE, market observers should have learned long ago that the Bureau of Economic Analysis (BEA) initial GDP estimates can’t be trusted. A perusal of their subsequent GDP revisions in the last five years reveals a clear trend: They are almost twice as likely to revise initial estimates down rather than up, and the downward adjustments have been much: larger on average. Measuring the size of the economy accurately in anything close to real time is difficult, inexact, and messy. : That is why the BEA has long pursued a policy of initial quarterly estimates (known as the “advanced estimate”), followed by two or three subsequent revisions as more thorough analysis comes to bear. : The first estimates come out about a month after the conclusion of a particular quarter. The second and third revisions then come in monthly intervals thereafter. But in the minds of the media, the public and the politicians, the initial report carries much more weight than the revisions. It is the initial report that attracts the screaming headlines and sets the tone. The revisions are typically buried and ignored. This creates an unfortunate situation where the initial estimates are both the most important and the least reliable. However, logic would dictate that revisions would fall equally in the up and down categories. After all, government bean counters are expected to report objectively, not to create a narrative or manage expectations. 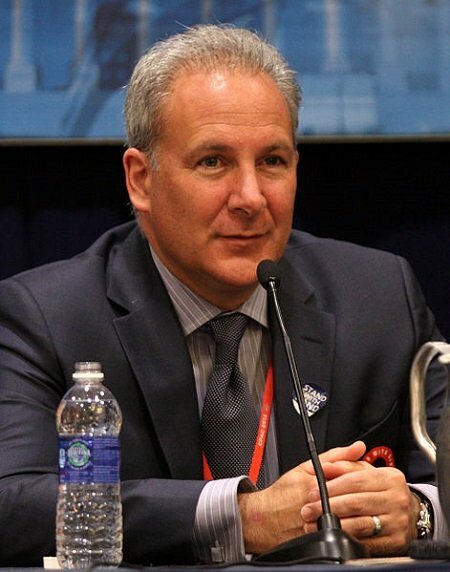 : If anything, I believe that the public would be better served if they would adhere to the conservative playbook of under promising. That is exactly what they seemed to be doing before the economic crash of 2008. 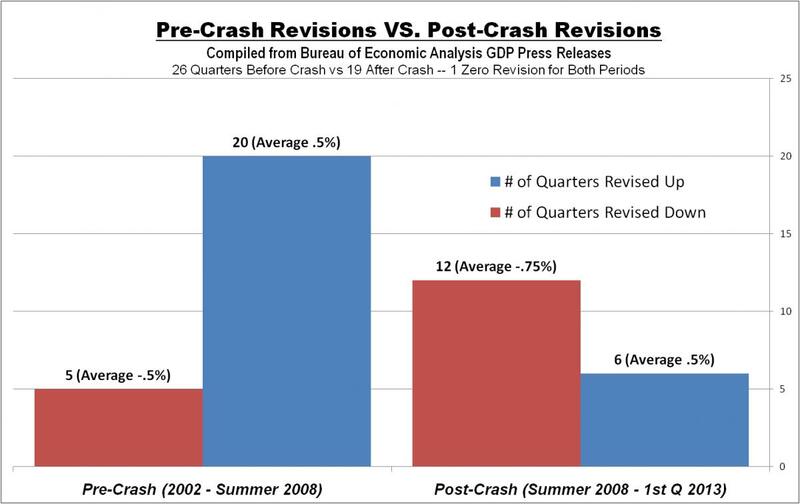 From 2002 to mid-summer 2008, the BEA revised initial GDP estimates a total of 25 times,: 80% of which (20 revisions) were higher than their initial estimate. However, the average amplitude of the upward and downward revisions were equal at .5%. The difference may have been a function of the relatively strong economy that the nation saw over that time (which I believe was a result of the unsustainable and artificial housing boom). See the chart below. But since mid-2008 we have seen a very different story. 67% of the revisions (12 of 18) have been downward, and those adjustments have been, on average, 50% larger than the upward revisions (.75% vs. .5%). Here’s another way of looking at it: Since mid-2008, revisions have shaved a total of 6 points of: growth off the initial estimates. This works out to be an average of 1.3 points of growth per year that some may have expected but that never actually happened. But there can be little doubt that these overly optimistic projections have worked: wonders on the public relations front. : The big Wall Street firms and the talking heads on financial TV set the tone by jumping on the new releases and ignoring the revisions to prior releases. That is precisely what happened last week when the better than expected 1.7% growth in 2nd quarter GDP overshadowed the .7% downward revision to 1st quarter GDP from 1.8% to 1.1%. The initial estimate for 1st quarter GDP, released back in April, was 2.5%. : Since the consensus expectation for 2nd quarter GDP was just 1%, the media jumped all over the “good” news, while ignoring the revisions to the prior quarter, and discounting the strong likelihood that Q2 GDP will be revised downward. : The nature of our short-term 24-hour news cycle is a big factor in this. Reporters are always looking for the big story of the day, not the minutia of last month. The lack of critical thinking and economic understanding also play a role. Of course even if you have the discipline to focus on the final estimates, you still aren’t getting the real story. All GDP estimates are based on imperfect inflation measurement tools, which: I believe are designed to under report inflation and over report growth. The most recent GDP projection used an annualized .71% inflation deflator to arrive at 1.7% growth. Anyone who believes that inflation is currently running below 1% has simply no grasp of our current economy. Look for more analysis of this topic in my upcoming columns. In the meantime, don’t get excited by initial reports of a healthy recovery. The reality is likely to be more sobering.